There is a great interactive link in Thursday's New York Times which allows you inside the room behind the 100-year-old clock on the facade of the city's Grand Central Station. The clock has a circumference of 13' and is surrounded by sculptures of Minerva, Hercules, and Mercury. The motor is plugged into a standard outlet and the clock hasn't missed a step since it was built in 1913. The "VI" is on a tiny hinged door, offering a view of Park Avenue. The face of the clock contains the world's largest example of Tiffany glass. The bell of the clock in the northeastern end of the Palace of Westminster in London is better known as Big Ben. This national symbol -famous for its reliability - just celebrated its 150th anniversary in May of this year. 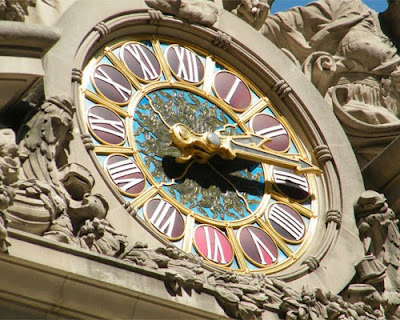 The largest 4-faced chiming clock in the world, each clock face is 23' in diameter and made of an iron frame containing 312 pieces of opal glass, some of which open to allow access to the hands. The clockwork mechanism weighs 5 tons and can be seen on video or on a virtual tour. The 3.9M pendulum hangs in a windproof box below the clock and beats every 2 seconds. 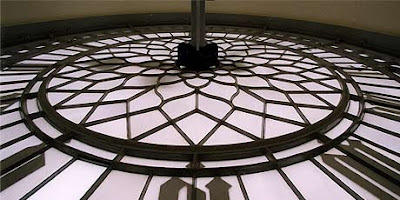 Despite being hit by a German bombing raid in 1941, which damaged 2 of the clock faces, Big Ben chimed accurately throughout the Blitz (although the faces of the clocks were darkened at night). 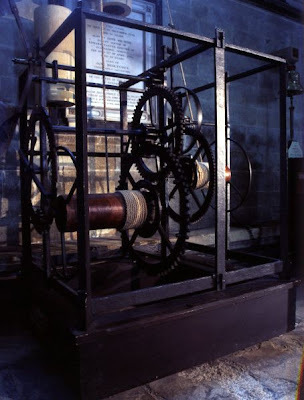 The clock in Salisbury Cathedral in southern England is the oldest working modern clock in the world, dating from about 1386 A.D. It operates on a system of weights attached to ropes that are threaded through pulleys 20' above the clock, and is wound daily. You can watch it at work - ticking every 4 seconds - here. It has no face, because the clocks of the time rang out the hours on a bell to summon worshippers to the 6 or 7 church services each day. The bell tower was destroyed in 1792, so the clock was placed in storage, where it was rediscovered in 1929 and restored to working order in 1956. Only a few parts were replaced, but to save on wear and tear the clock now chimes only at special demonstrations.